The Lemon Grove Deli is a little restaurant that’s nestled in the heart of Lemon Grove. It’s in amongst the many little shops and businesses in Downtown Lemon Grove, near the trolley station. The Lemon Grove Deli serves up some mean breakfast and then also does sandwiches in the afternoons. You can stop by on Sunday and get breakfast until 2PM – which is what Jake and I did on a recent weekend. 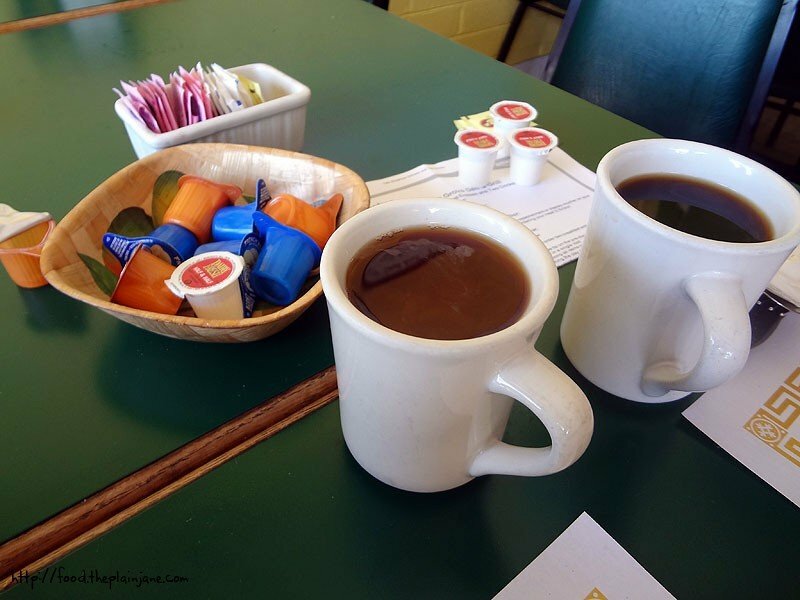 This is one of my “adventures in groupons!” posts – I had a coupon for 2 breakfast and 2 drinks for one price. It was just the two of us for breakfast that morning and we sat outside on the patio to enjoy the beautiful summer day. There was a slight wait in getting someone to see to us, but we were in no kind of rush. When our waitress did come by we asked for some coffee while we continued to look over the menu. The coffee was pretty good for a standard cup. Not too strong but strong enough to have a nice, distinct flavor. I also enjoyed that they had a little bowl of different flavored creamers. They had vanilla, hazelnut and plain and I chose to dump a couple of hazelnuts in mine. Hazelnut + coffee = a match made in heaven to me. 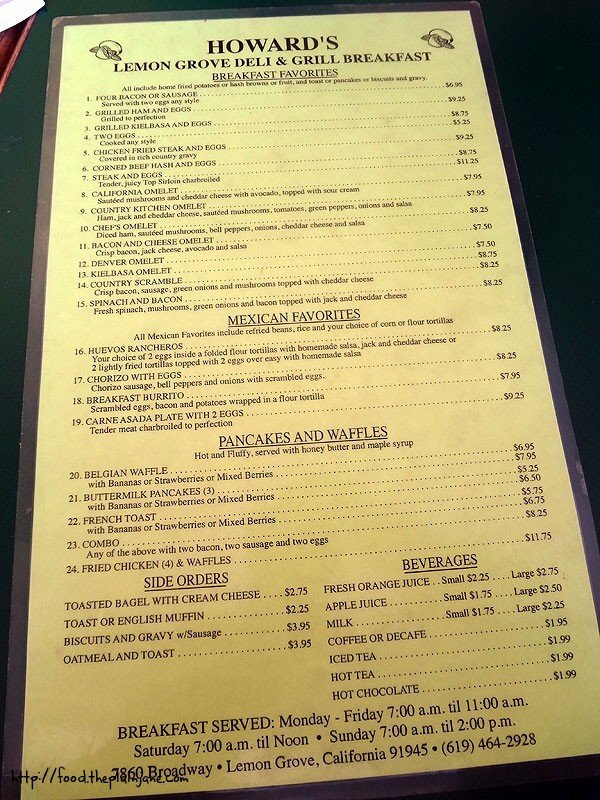 Here’s a peek at their breakfast menu. There’s a really good amount of options and you get a TON of food for the price. See that plate of biscuits and gravy? And the pancakes? Both side dishes for each meal. 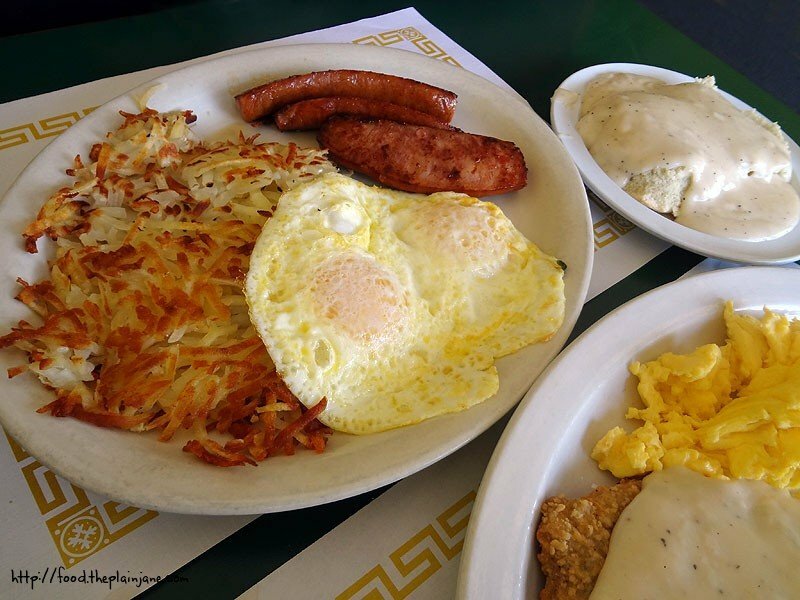 Jake decided to grab the kielbasa and eggs breakfast with a side of biscuits of gravy (and of course it also comes with hash browns, because, well, why not). We’ve been doing the “share all of our food” thing ever since Vegas and it pretty much applies to everything now. I gave him some of mine and I got to have half of the kielbasa as well. The kielbasa was nicely grilled. I also had some of the biscuits and gravy. The gravy was a nice, basic white gravy with a good amount of seasonings. Very basic, but still quite good and very filling. 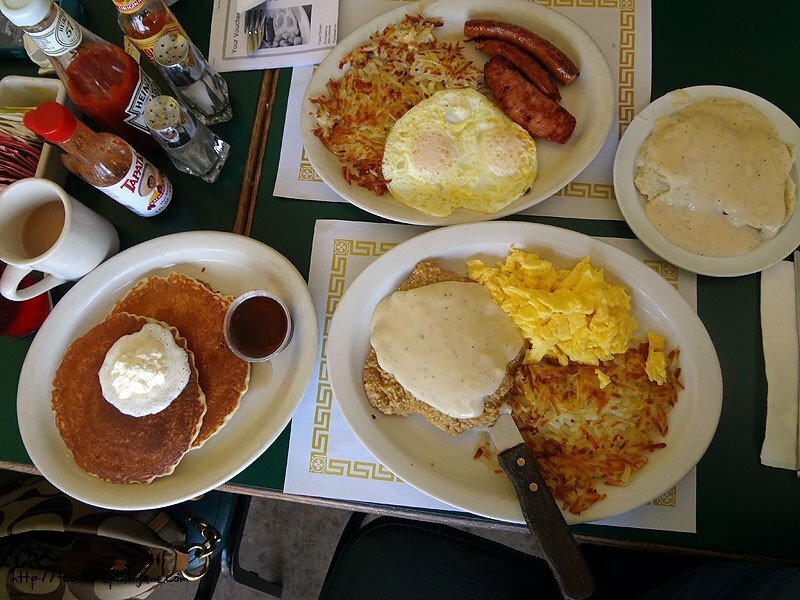 I choose the chicken fried steak with a side of pancakes. I can’t believe you get a whole stack of pancakes on the side in addition to the rest of your meal. Unreal. 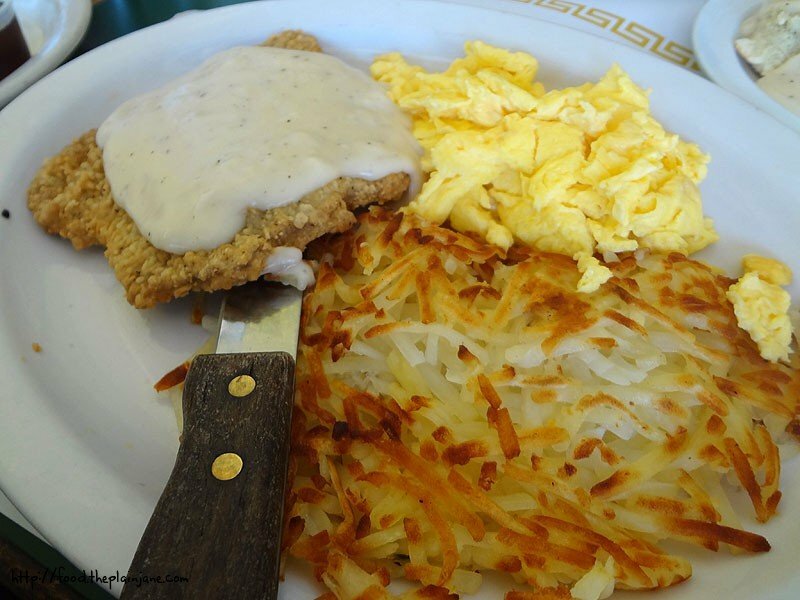 The chicken fried steak is a solid one with the same type of gravy found on the biscuits. This is a pretty basic chicken fried steak – breaded and fried with a crisp, outer coating and a good douse of gravy. Not too greasy, the steak was done well and kept it’s rich flavor intact. The hash browns here are good – nice, crispy exterior with a slightly creamy middle – though not as good as the Huddle’s hash browns. 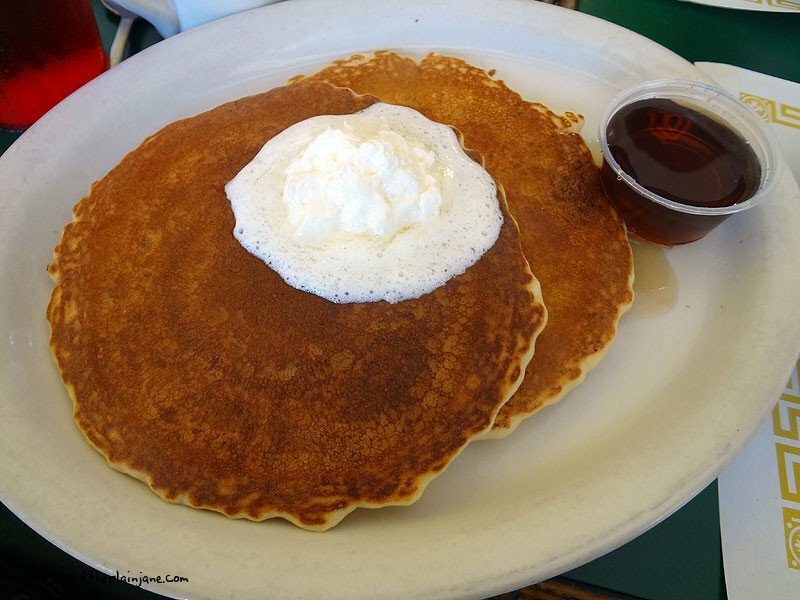 The pancakes are light and fluffy and evenly browned. A good dose of butter comes on top with warmed maple syrup on the side. Very tasty and very fulfilling. All in all, Jake and I enjoyed our breakfast a whole lot. It’s very simple, down to earth food – nothing frilly or fancy here, just basic, good eats. There’s a lot of options available and we really felt like we could have gotten just one plate of food to share – all of the extra sides and fixings make for a very hearty and satisfying meal. So your saying you likes the place…Got it. Man, i have got to go here!!!!!! The chicken fried steak looks so good, but I would want my gravy on the side so it doesn’t get soggy. Wow, great groupon deal that was! Hi CC – It was a really good deal! Cute, tiny little place with good, solid food. The steak didn’t get too soggy, but I know what you mean about soggy food – I hate soggy food! Chicken fried steak is one of my favorite things on the planet. I go to the UCP thrift store, which I think is across the street all the time. I will have to try that place out. And kielbasa? YUM!